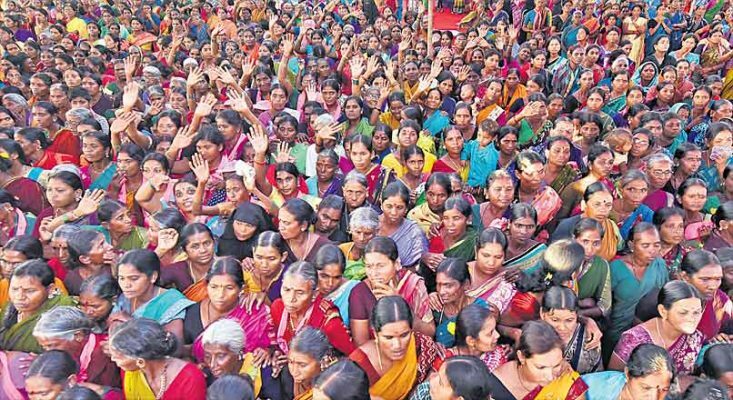 Armoor: State government employees have a lot to cheer about with Chief Minister K Chandrashekhar Rao on Thursday announcing plans to increase the retirement age of the employees from the present 58 to 60 or 61 years once TRS comes to power. Following requests from the employees unions, the TRS Party Election Manifesto Committee was examining the feasibility and will propose the revised age of retirement in its manifesto shortly. Addressing the Praja Ashirwada Sabha here, Chandrashekhar Rao asserted that the TRS had always been employee-friendly and advised the government staff not to be fooled by false promises made by some political parties. “We gave the government employees the highest fitment benefit that no other State in the country can match. We are also actively considering giving interim relief at an appropriate time after forming the new government,” he said. Employees from various organisations submitted a representation to the TRS Election Manifesto Committee chairman and TRS secretary general K Keshava Rao in Hyderabad on Thursday, with a set of demands seeking their inclusion in the party manifesto. Keshava Rao immediately took up the issue with the Chief Minister who is learnt to have given his nod to a majority of the proposals. He asked the TRS Election Manifesto Committee to study the feasibility of implementing the requests from the government employees and submit a report. The Chief Minister also advised the farmers not to fall prey to the empty promises being made by the Opposition parties with regard to crop loan waiver scheme. “Except for a few rich farmers, no small or marginal farmer takes farm loans of more than Rs 1 lakh and the TRS party’s promise to waive crop loans of up to Rs 1 lakh are more realistic and beneficial to majority of poor farmers,” he said. Earlier, addressing a rally at Khanapur in Adilabad district, Chandrashekhar Rao called on people to think carefully who they want to vote for. “Many people will tell you many things. Consider how you were neglected for decades by Congress and TDP and then look at the development that has taken place in the past four years under TRS. All the development and welfare programmes initiated and implemented by the TRS government are right before your eyes to see,” he said. The TRS president said: “Ask yourself who should be elected. Don’t get confused by claims made by Congress and TDP who did nothing for 50 years. If by chance Congress is elected, then remember, all the development TRS initiated will come to a halt,” he said.